Providing the world's gold standard in fit testing using our patented Controlled Negative Pressure technology with the Quantifit is what we set out to do many years ago. However, we deemed it necessary that to provide effective, quick and informative information on our technology we needed a vast, trusted distributor network to reach all corners of the world. Many times manufacturers struggle to find partners who can promote and sell technical instrumentation while also providing industry leading service. 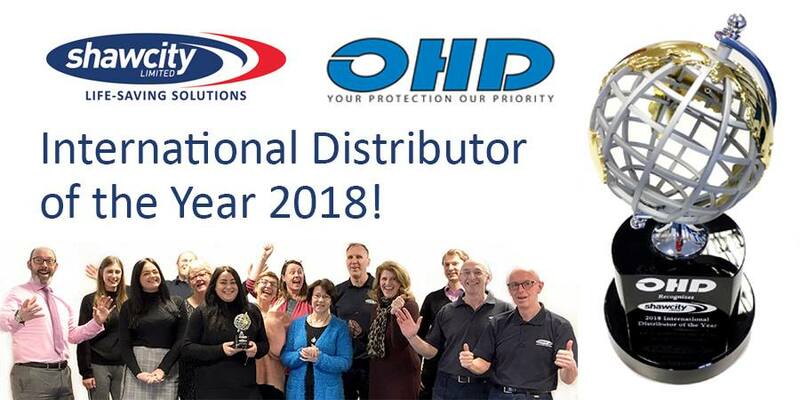 Every year OHD recognizes an International Distributor partner that exhibits excellence in sales growth, regulatory development as well as leading sales and marketing efforts. We are ecstatic to announce that the 2018 award is presented to ShawCity Limited in the United Kingdom. ShawCity has led the way in 2018 with world class results across all criteria. From my perspective, they are the global benchmark for all international distributors who partner with OHD and we are thrilled to present this award to them! Providing world class safety instrumentation coupled with world class service is what OHD and its Partners strive to do. Interested in learning more at OHD or the Quantifit Mask Fit Tester?